Connecting the indoors with the outdoors and bringing natural elements into home design has been a popular trend for several years. Bringing nature into bathroom design helps create a tranquil, calming and spa-like atmosphere in your home. There are many ways to incorporate natural elements in the bathroom, regardless of your budget. Some changes are easy and inexpensive to make, while others are more expensive and permanent. 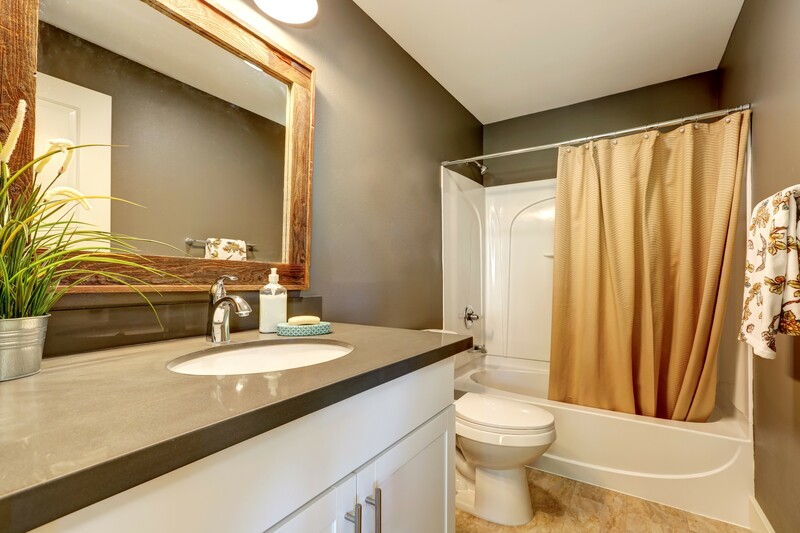 Changing paint colors is a great place to start transforming your bathroom into a natural oasis. Select neutral colors for the bathroom, including lighter shades of beige to rich, earthy tones. This color scheme can be carried over into towels, bathroom accessories and decorative objects to create a coherent natural design. Plants and flowers are easily added to the bathroom and provide a beautiful, natural focal point in any room. Green plants work well with any color scheme but create a particularly striking contrast against white walls or countertops. A vase of fresh flowers can be placed on a countertop, windowsill, or bathtub ledge to add a pop of natural color to the room. When creating a nature-inspired bathroom, natural light is an important component of bathroom design. Don’t cover windows with heavy blinds or curtains, as this keeps the light out. Choose lighter window treatments to bring in the more natural light. Some designers are using plants and bushes outside the bathroom window to address privacy concerns without blocking the windows. This method stops people from looking in but allows the light to enter the space. Wood is a natural feature that is often used in the nature-inspired design. However, wood is not always suitable for use in the bathroom, particularly in high traffic areas, since it is easily damaged by exposure to water. If you love the look of wood, but worry about using it in the bathroom, there are faux wood tiles available. These offer the look of natural wood, but won’t be damaged by water. There are many options for natural stone tiles that are great for use in bathroom design. Pebble tile is designed to make it look like the area is covered with pebbles in round and oval shapes. After installation, the entire floor appears to be covered with pebbles. Natural marble flooring is also another idea that adds a simple and lovely, natural touch. Natural stone bathroom vanity tops are beautiful in a nature-inspired bathroom. The natural stone industry offers a wide range of stone color options for bathroom vanity tops. Choose from a variety of stone colors in harder and softer stone, depending on the type of room. Softer stone, such as a limestone bathroom vanity or marble vanity tops are better in low traffic areas, as there is less risk of damage to the stone.